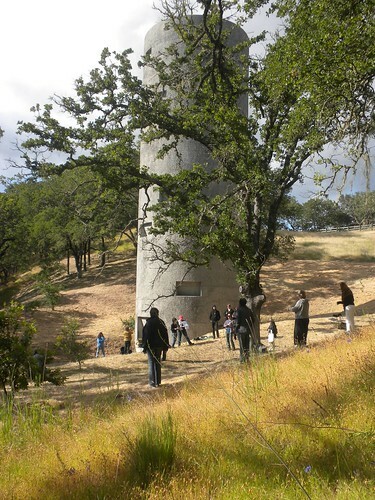 The Garden of Memory walk-through performance event is held every June 21st, from 5:00 p.m. to 9:00 p.m. PDT, to celebrate the Solstice, at The Chapel of the Chimes, in Oakland, California. It is recommended that you purchase tickets in advance, because there are usually lines at each door — but tickets are available on-site. 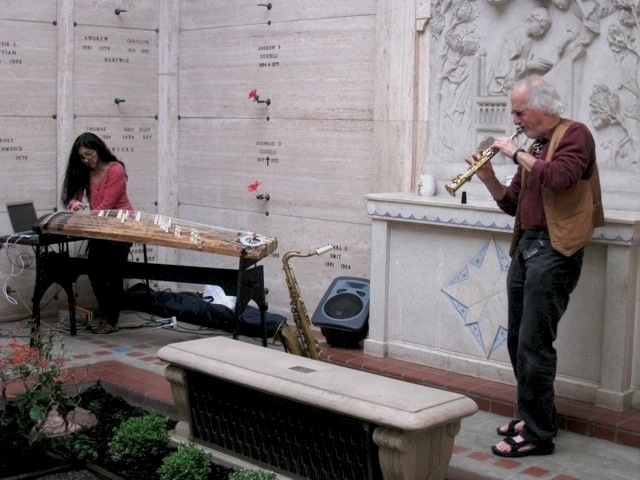 I have participated in the annual Garden of Memory event at the Chapel of the Chimes since its first year, in 1996, when Sarah Cahill founded this extraordinary, one-of-a-kind, site-specific concert. In the first few years, as a walking “audient,” I recorded audio, took photos and shot video of the who’s who of Bay Area musicians and other performers, and the audience members, a fascinating cross-section of Bay Area residents. The historic landmark columbarium, designed by architect Julia Morgan, contains elegant, winding staircases and passageways on each level that lead one through a labyrinth of over 110 chambers, replete with beautiful, tropical indoor gardens, water fountains and pools, and the quiet inner rooms where the deceased rest peacefully in “urns” that look like bound books in bronze and other elements. The lovely stained glass windows and roof skylights bathe the building in a remarkable light, even more magical during the late afternoon golden through sunset hours (5:00-9:00 p.m.), when the Garden of Memory event occurs on the Summer Solstice (June 21st) each year. In the early 2000s, I started performing there, usually with the Cornelius Cardew Choir. In 2005, one of the pieces we performed was one I had composed specifically for the location and occasion, with written text, entitled Wings of Silver Light. Since then, I have written an updated version of the piece, which now has jazz/gospel elements, much different and more complex than the original version. This piece has an anti-war and anti-violence theme, which unfortunately, is still very relevant today. 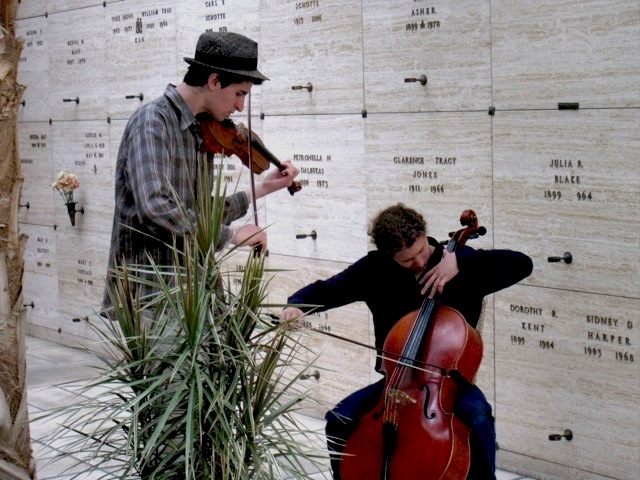 In fact, many of the composers and performers have created works specifically for the Garden of Memory event. 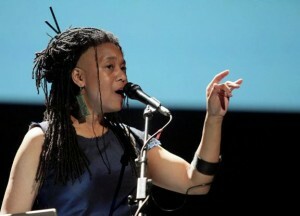 There are also a number of very creative electronic and computer-based musicians, as well as dancers, poets, theatre artists, and occasionally, a few video artists, who have performed or presented contemporary work at the event. 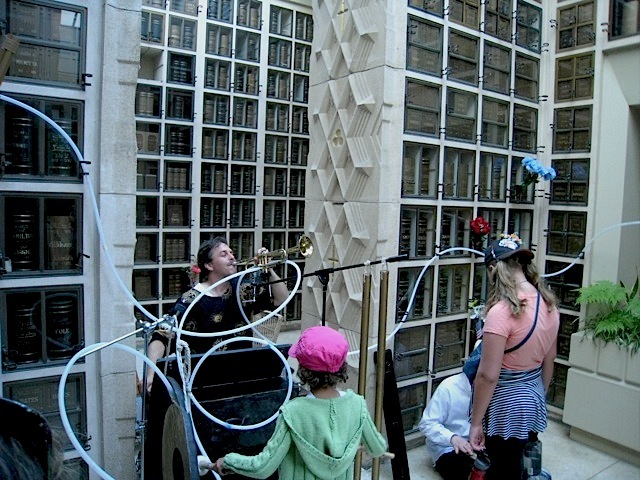 Some musicians build their own instruments or use other technologies they have developed, including some that utilize ambient sounds from the flowing water fountains, ponds, or plants nearby. Last year, I dedicated my own improvisation on composer Pauline Oliveros’s Heart Chant to the memory and honor of the people killed in Charleston, North Carolina, and their families and friends. This year, sadly, I will be dedicating my Heart Chant to the memory and honor of the people killed and injured recently in Orlando, Florida, and sending healing sounds to their families and friends. I will also meditate as I sing, on passing reasonable gun control laws, and turning hate and discrimination into love and peace everywhere, for all beings. On a more joyous note, what is especially wonderful, for a walk-through audience participant, is the cross-blend of delightful sounds you hear in the passageways, between musical performers in different, adjacent chambers; and your sense of discovery, as you “find” a performer hidden away in a remote warren-like corner of the building. Children love the event, and I am sure that the deceased members of the audience must appreciate being serenaded in their quiet slumber by the annual collection of musicians performing next to their spaces of internment. 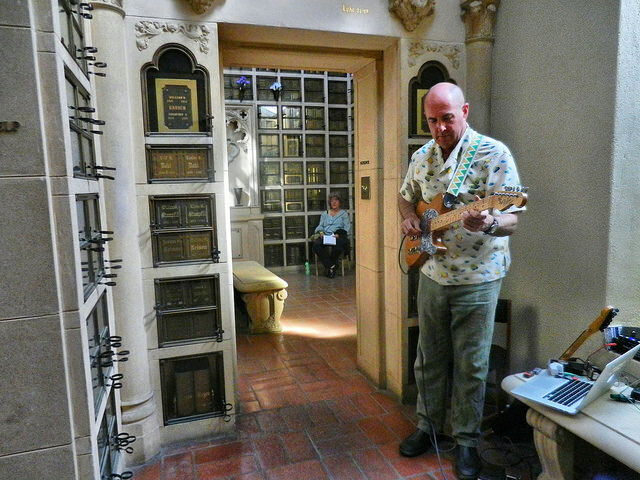 Indeed, there are a number of prominent musicians and other Bay Area citizens who are interred at Chapel of the Chimes. When you enter the building, you get a map at the ticket table, so that you can find your way around, and locate any performer friends you may know at the event. For those who may not be able to walk for an hour of more at a time, or if you’re bringing small children, there are at least two concert spaces on the main floor, where a number of the musicians perform over the four-hour period. There are elevators in the building, so much of it is wheelchair accessible. 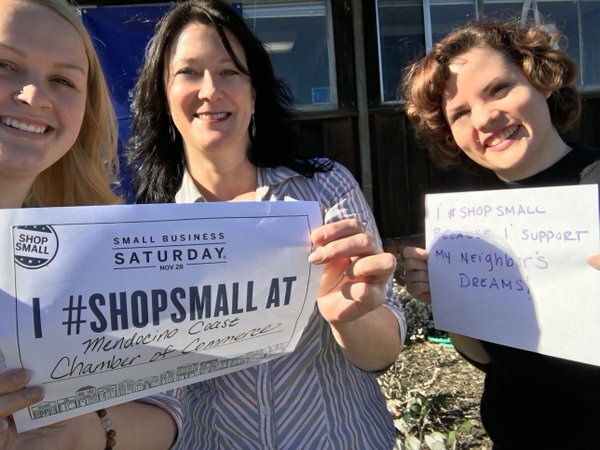 There are vendors near the Piedmont Avenue entrance that sell food and beverages, and there are water fountains in the building, but you may want to carry bottled water with you and wear comfortable shoes. The event has become very popular, and seating is limited in some of the smaller chambers of the building. Although Garden of Memory is known as an interactive “New Music” event, you’ll actually find quite a diversity in musical styles among the performers, and sometimes, there have also been performing ensembles that have included dancers, text, video and other elements. Following are a few selected photos from previous Garden of Memory events, and other information about the Cardew Choir’s performance this year (below the photos). Several of the Cardew Choir members are also performing in other ensembles for part of the evening. 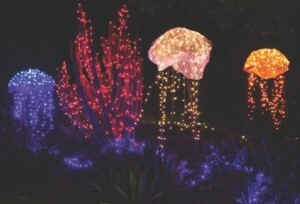 Check for updates at the Garden of Memory web site. The audience is invited into our circle to sing composer Pauline Oliveros’s meditative piece, Heart Chant, which includes improvisation by audience and the Cardew Choir. Although we usually perform a repertoire of works at other performances, often composed by members of the choir, this piece has been performed at nearly every annual Garden of Memory Walk-Through Concert by popular demand, and is now a tradition at the event. The Heart Chant is followed by the sunset bell-ringing ceremony at approximately 8:30 p.m., when the entire chapel is filled with the echoes of song and bells drifting down all three floors, unforgettable in the rose and mauve sunset glow through skylights and stained glass windows. There are several sets of photos on my Flickr account of past Garden of Memory events, including of a previous year’s Heart Chant. There is also a set of YouTube video clips of Heart Chant, beginning with this one. In addition to the photos above, you can also view the Flickr photo pool for previous Garden of Memory events. 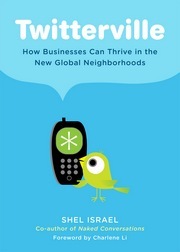 A previous blog post about this event can be found here. More photos of this year’s performers are available at the Garden of Memory web site. 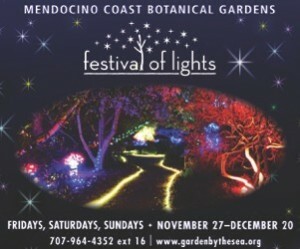 Media coverage of past Garden of Memory events has been archived on their web site. This list may be updated as the program is finalized. There is a downloadable map of the locations for all the performers here. Additional maps and programs will be available at the door on June 21st. Are you curious about what you’ll experience during the entire event? 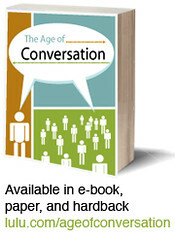 Want a sample preview? You can read more, and watch and listen to the video, at New Music Box: “Let’s see what this is!” — Garden of Memory 2013. Come join the Cardew Choir in singing the Heart Chant! Whether you sing with us, or just listen, you’ll want to take photos, shoot video, or record some of the sounds you’ll hear in this magical environment. Please subscribe to this blog or ask to be added to the Creative Sage Arts e-letter list for news about other events, projects, books, and performances coming up in the next year, in which I’ll be participating. Please feel free to ask questions or comment below this post — and come say hello afterward, if you attend this event. We look forward to seeing you there! 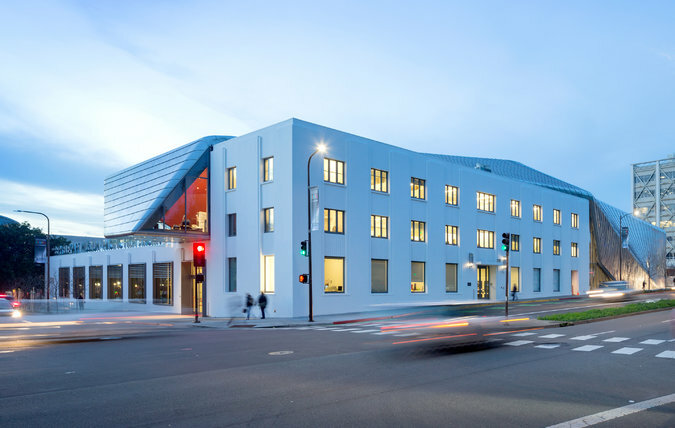 This is just a quick blog post to mention an upcoming performance at the wonderful new Berkeley Art Museum/Pacific Film Archive (BAM/PFA), in the Full: Voice series curated by Sarah Cahill! (There has been quite a bit of other publicity, so you may have heard about it already). 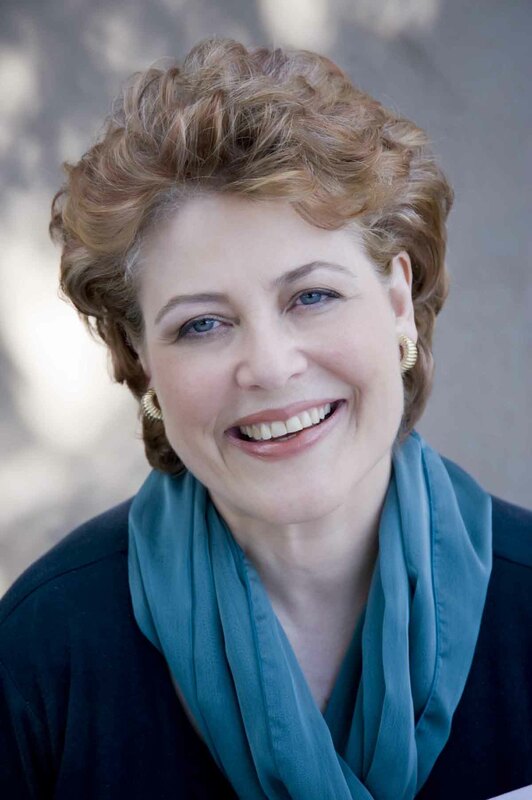 This performance is an exploration of the human voice with virtuoso singers. The internationally acclaimed, multidisciplinary artist, Pamela Z performs, working her magic with live electronic processing and sampled sound. In addition, bass vocalist Richard Mix joins us, reprising his performance of unaccompanied works by renowned composer Julian Eastman that thrilled L@TE audiences four years ago. You can read a recent article about Pamela Z’s groundbreaking work in the East Bay Express. 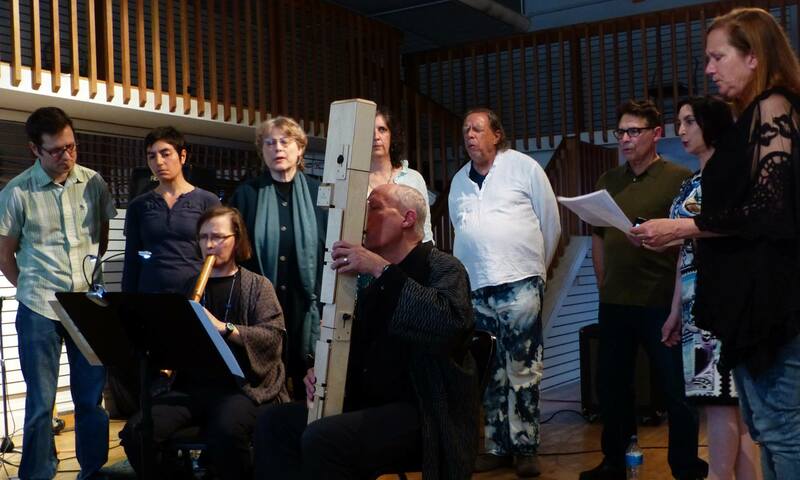 Also filling our space with music is the Cornelius Cardew Choir, a “Deep Listening” inspired musical ensemble that pushes the boundaries of vocal performance practice. More information about the choir is available on Facebook, and on our web site. 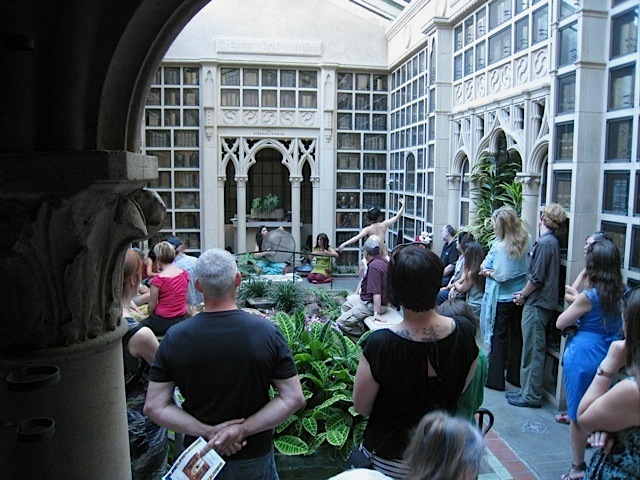 Admission to the performance is included with gallery admission. Please note that seating is limited, although there is standing room, and wheelchair access near the seating area. 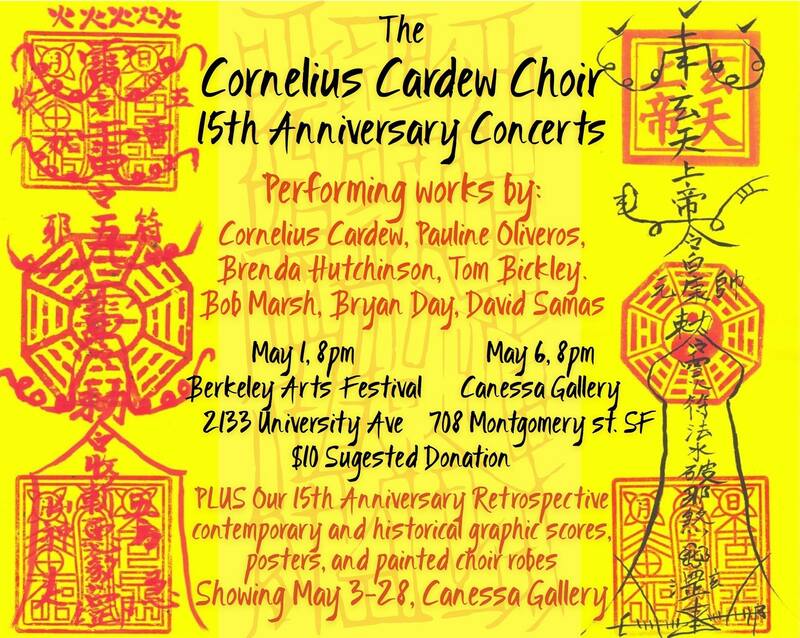 I’ll be performing with the Cornelius Cardew Choir, named after the late British composer, Cornelius Cardew. Among his unusual pieces, which include text, sounds and musical phrases plus passages of silence, mapped out for performers in a complex series of instructions, are his seminal, numbered Paragraph works, overall entitled: The Great Learning. The choir has performed most of the Paragraph pieces intermittently since 2001, when the Cardew Choir was founded. We’ll be performing one piece, Paragraph 6, at this BAM/PFA performance. In addition to vocal sounds, we’ll be using small percussion and found object instruments in this version of the piece. 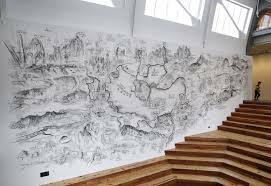 Part of the performance will be the resonance and incredible architecture of the new BAM/PFA museum, with its wonderful mural in the performance space. You can explore the exhibition galleries and discover simultaneous performances throughout the building. The New York Times’s arts writer David Gelles spotlights the new BAM/PFA in a trend piece on how museum administrators and architects are incorporating sustainable features in the building design process. Please come and say hello after the performance, if you’re able to attend! 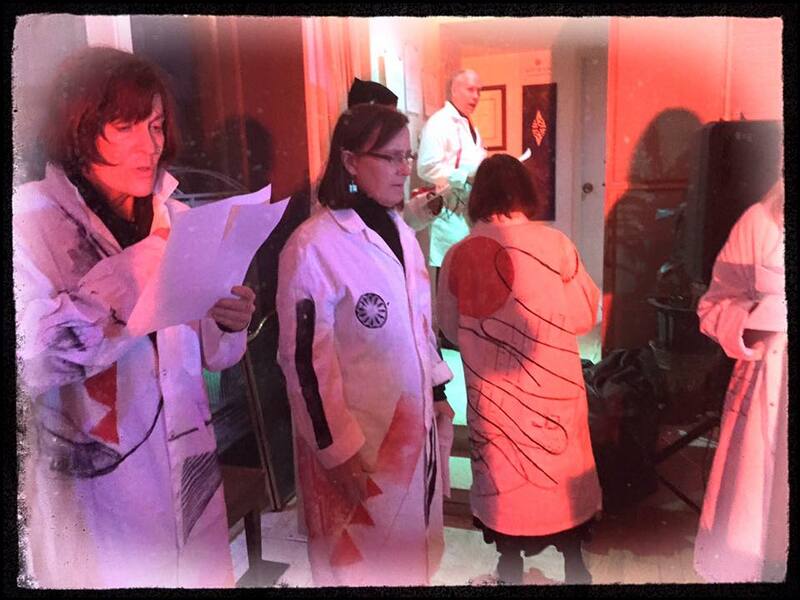 There will also be two other Cardew Choir performances coming up in May, 2016, at two different venues, in San Francisco and the East Bay. Watch this blog for updates! 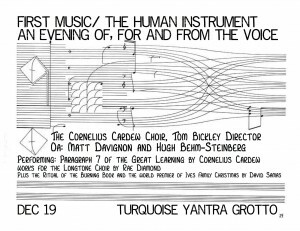 A musical ensemble I often perform with, the Cornelius Cardew Choir, will be performing this Saturday, on December 19th, as well as another vocal group, the Long Tone Choir, on Sunday, December 20th, with several additional musicians. Members of both of these vocal ensembles compose original contemporary music pieces, which are often performed by each group. The two vocal ensembles have several members in common, so it seems appropriate to include them both in the same blog post. ~ Paragraph 7, by Cornelius Cardew, the composer, musician, and social activist for whom the choir is named. It is noteworthy that December 13th is the anniversary of Cardew’s tragic death from an auto accident in London, in 1981. Our performance will be in honor of the composer’s life. More information about the turbulent life of Cornelius Cardew is available here. 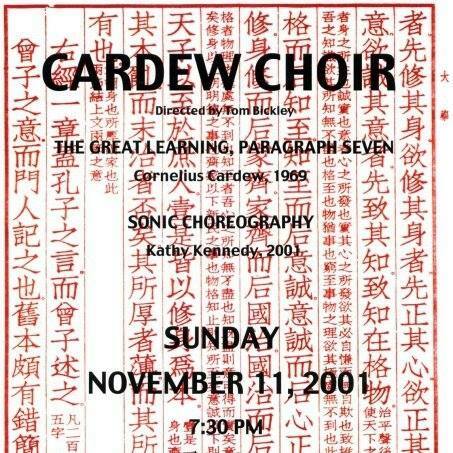 We are glad to be performing one of Cardew’s most noteworthy pieces, Paragraph 7, which is part of his Paragraph series. 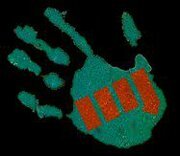 ~ The Burning Book + The Ives Family Christmas, composed by David Samas, with community participation, and original improvisations for processed voice by OA. 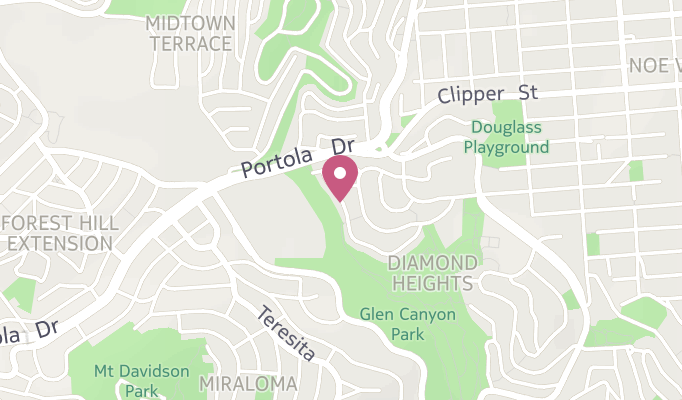 The performance will take place on Saturday, December 19, 2015, at 8:00 p.m. PST. Email in advance for reservations, due to limited space. A limited number of tickets will be available at the door. Founded in 2001, the Cornelius Cardew Choir is a vocal performance ensemble based in the San Francisco Bay Area. 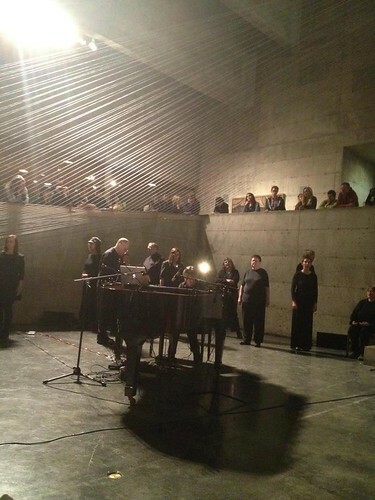 The choir represents a dynamic intersection of community and experimental music brought together by singing. 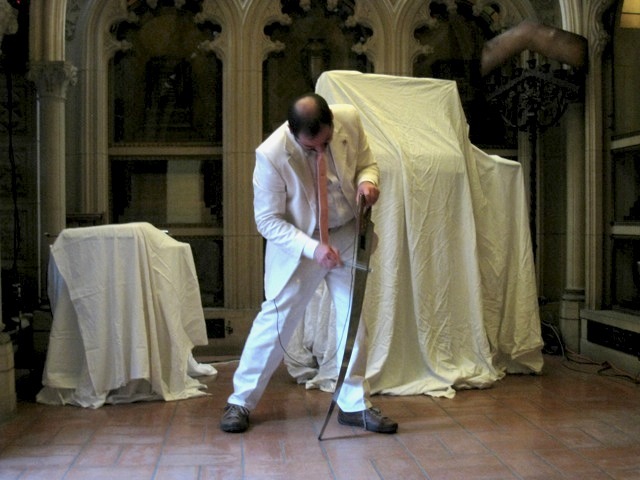 Occasionally, as in this performance, there are musical instruments or electronics in some of the pieces, along with vocal parts. The ensemble members collectively work to turn their ideas into improvisations and composed pieces. All participants feel free to make suggestions about ways of performing a given piece, or to try new approach to singing, and most of the choir members are also composers and instrumentalists. Sometimes, there are elements of text, gesture, movement, and video or visual art in the choir’s performances. 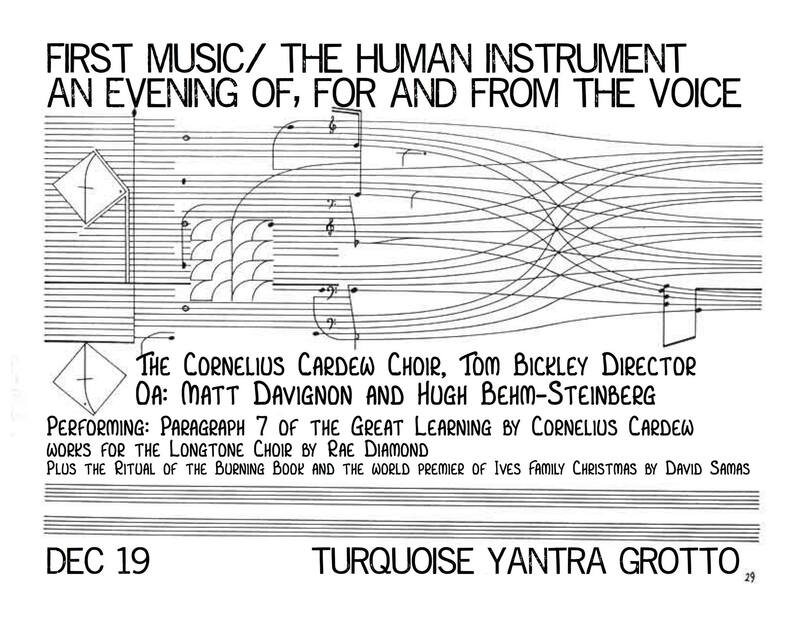 Some of the Cornelius Cardew Choir members are also members of the Long Tone Choir, and will be performing in both concerts, on December 19th and 20th (see below). 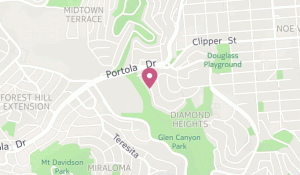 The Turquoise Yantra Grotto is located near the Diamond Heights and Glen Park neighborhoods in San Francisco. More information, and a map are available on the Facebook page (or see below). 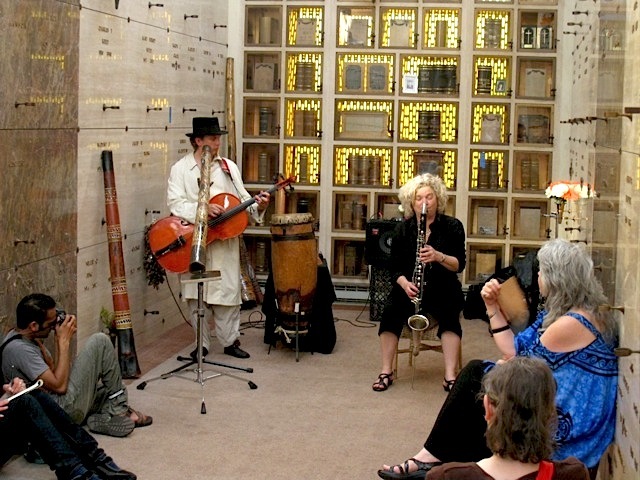 The Turquoise Yantra Grotto is a cozy venue offering a diverse blend of ethno-modernist music in an intimate house concert setting. 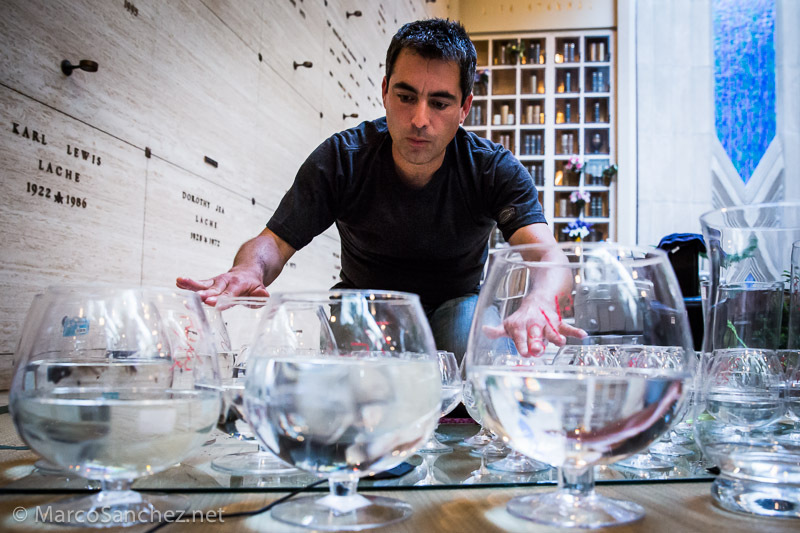 The hosts curate a monthly concert juxtaposing acts from among the San Francisco Bay Area’s most notable contemporary composers, performers and instrument inventors. Chinese tea service in the planted atrium offers guests an opportunity to mingle with each other among a menagerie of tropical birds and unique invented instruments, including the gamelon piano (an upright re-tuned with two Indonesian scales, and a set of haunting bell tones), and the zen industrial carillon (an arrangement of over 20 bells cut from high pressure gas cylinders). A classic Steinway grand piano rounds out this Eichler-style environment, with an ever-changing gallery of artworks by local artists. 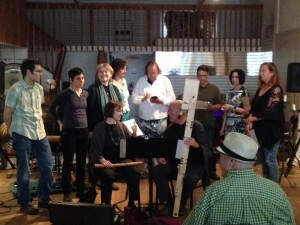 For more information about the Cornelius Cardew Choir, visit their Facebook page, or web site. 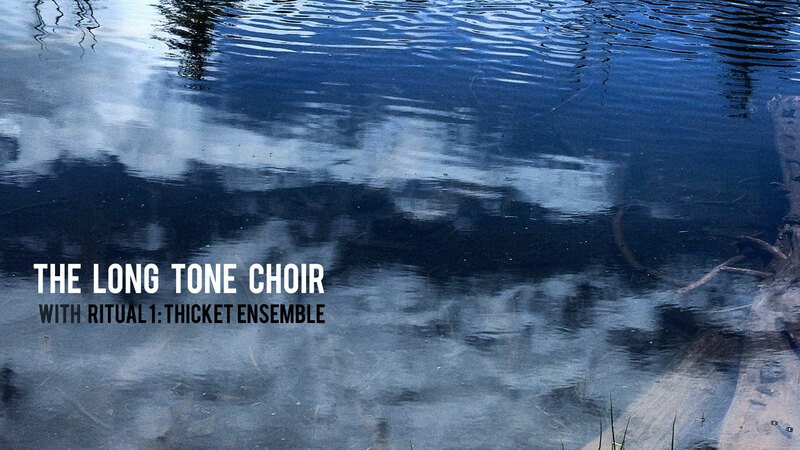 In one of the darkest days of the year, the audience is invited to close their eyes and open their ears, in an evening of immersive sonic experience with the Long Tone Choir and Thicket Ensemble. The Long Tone Choir will steep the audience in a variety of mesmerizing vocal soundscapes, some of which will include optional audience participation. 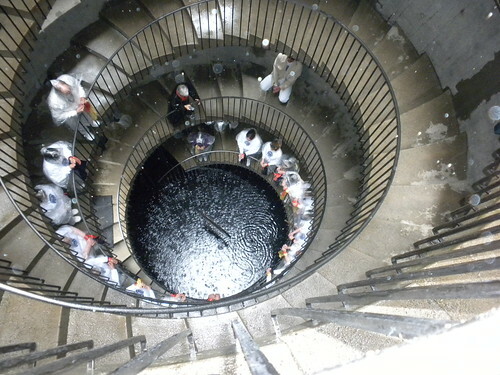 They will perform composer Rae Diamond’s Circling Intervals, along with other original pieces. Thicket Ensemble’s RITUAL 1 will bathe the audience in water-inspired sound from the inner ear-out. RITUAL 1: Thicket Ensemble is comprised of musicians Mateo Lugo (Totonoko) and Suki O’Kane. 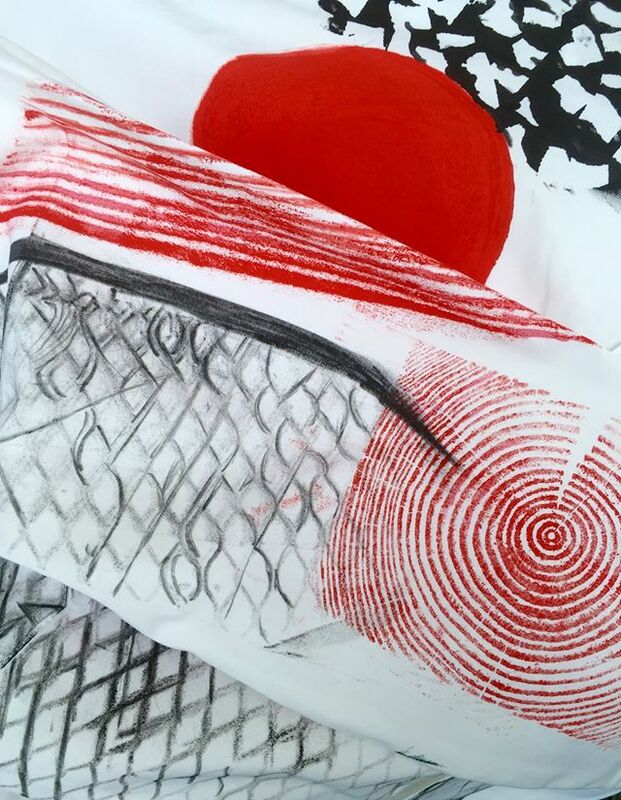 They convened with Katherine McDonald and Tim Kim for the first time in early 2015 to accompany the movement performance of Mari Osanai, with Dana Iova-Koga and Shinichi Iova-Koga (inkBoat). 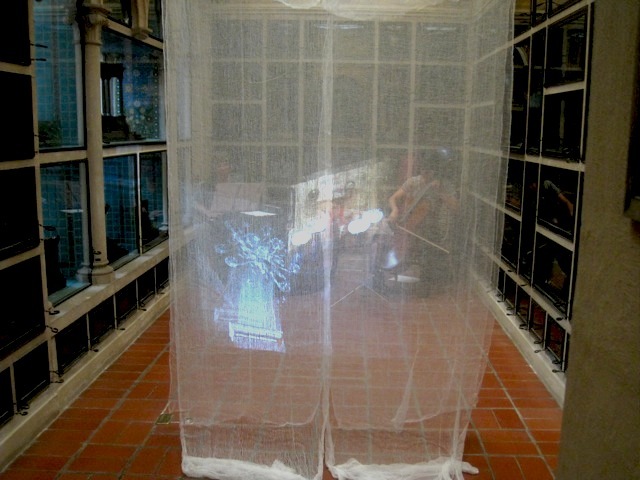 Combining voice and acoustic strings with processed water and found objects, through the process of empathic listening, they later participated in a performance of inkBoat’s 95 RITUALS, presented in Summer, 2015. InkBoat is an artistic collective that developed and performed a monumental set of works informed by veteran Bay Area dancer/choreographer Anna Halprin’s work. The Long Tone Choir, which celebrates its two-year anniversary with this performance, is a movement in several variations, based on the cornerstones of listening, breathing, mindfulness, and a biotic and responsive experience of time. The variations: 1), a loose community of listeners and sounders; 2), a growing body of meditation-compositions; 3), a path of exploration. 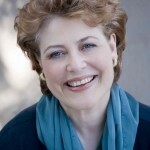 The Long Tone Choir is facilitated by composer/performer Rae Diamond. This performance will be held on Sunday, December 20, 2015, at 7:00 p.m. PST. Tickets: $10-$15, sliding scale at the door. For more information, visit the Long Tone Choir’s event Facebook page. 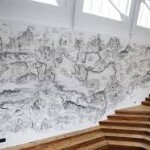 The Subterranean Arthouse Collective is an interdisciplinary community art space that offers diverse opportunities for local, national, and international artists to teach, create and present their artworks. Through weekly classes, performances, film showings and visual art exhibitions, the Collective encourages dialogue between disciplines and between artists. 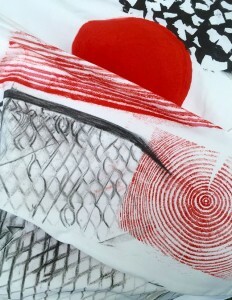 They inspire a sustained curiosity about life through the practice of art. 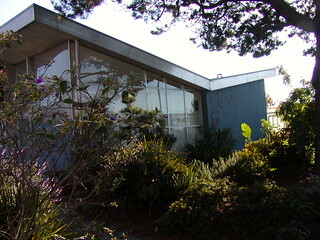 The Subterranean Arthouse Collective is rooted in a tradition of experimentation unique to the Bay Area, as it extends its branches to the terrain of other arts communities. 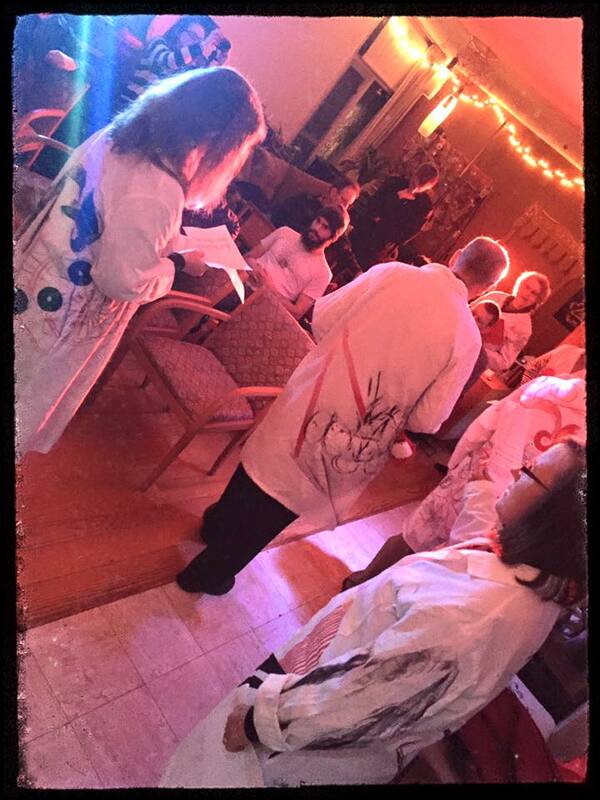 We hope to see you at either or both performances, which promise to be intriguing, immersive experiences, and substantially different from each other. I’ll only be performing with the Cardew Choir on Saturday, 12/19, as I have a conflicting recording assignment with Links Sound on Sunday. Please stop by and say hello, if you come to the Cardew performance, and I hope you’ll also be able to enjoy the Long Tone Choir performance. Happy Holidays to all my readers! I’ll be posting more in the next year about upcoming book, art, media, and music projects here at the Creative Sage Arts Blog…and email me to get on my mailing list! In the subject line, please indicate whether you only want to be on my arts mailing list, or if you also want to be on our company e-letter list as well. Season’s greetings! The 3rd Annual Richard Waters New Music Festival celebrates invented instruments and extended techniques, and features composers, musicians, and instrument builders from the greater Bay Area. 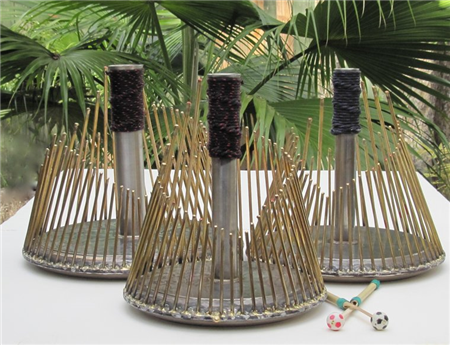 The festival is inspired by the late Richard Waters and his invention, the Waterphone (pictured above). This year’s festival includes a Waterphone Orchestra and a guest appearance by Rayme Waters and Waterphone builder Brooks Hubbert. 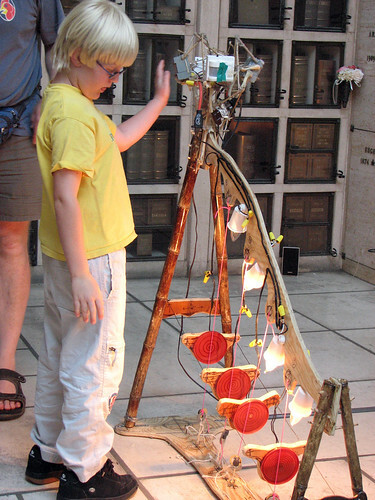 “The late Richard Waters was a sweet, fun-loving, adventuresome instrument designer/builder, sculptor, musician who always brought magic to the moments one spent with him. Almost always with a smile, Richard knew how to enjoy life and live it to the max! He is known throughout the world for his invention, the Waterphone. So, give up a prayer, a meditation, or just a quiet thought for Richard in appreciation of his kind presence.” — Tom Nunn, Artist, Musician and Instrument Builder. The Festival will take place on Saturday, June 27, 2015, from 1:00-10:00 p.m. PDT. An all-day pass is $10.00 at the door. You can attend any or all of the performances for that admission price. 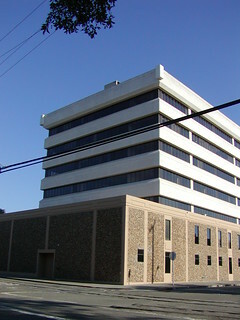 The space is wheelchair accessible. For more information, please see the Bay Improviser web site and the Facebook event page. 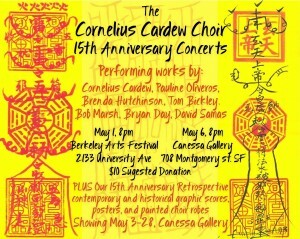 I will be performing with the Cardew Choir and Gusty Winds May Exist. 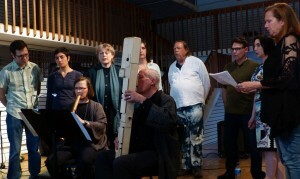 Together, we will perform three intertwined pieces: Waterfall Meditation, composed by Pauline Oliveros; Takiochi, a traditional shakuhachi piece performed by Nancy Beckman; and Environmental Dialogue, by Pauline Oliveros, which will involve vocal improvisations on a timed score, interwoven with shakuhachi and contrabass recorder solos and duets. Tom Bickley will perform on contrabass recorder. 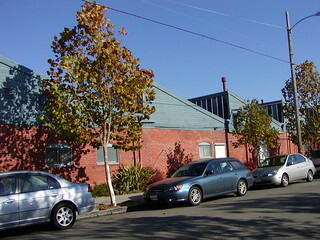 The Berkeley Arts Festival Gallery and Performance Space is dedicated to the notion that in Berkeley, every day is an arts festival. 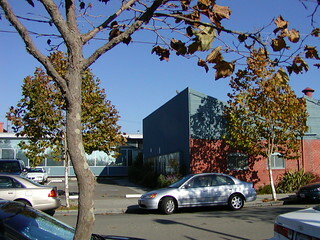 The venue presented its first month-long Arts Festival in 1997, with the support of the City of Berkeley. 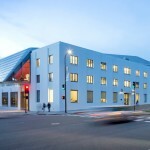 In addition to art exhibitions, the venue hosts events for writers, and concerts featuring some of the most creative artists in the San Francisco Bay Area. At Creative Sage Arts, we will be going on vacation for the rest of the summer, while continuing to work on writing, music and other arts projects. We will post again as soon as another event is confirmed. We are also planning to update our entire web site over the next several months, so you may see some gradual changes. Meanwhile, please keep in touch with me (Cathryn Hrudicka) by getting on my artist email list. 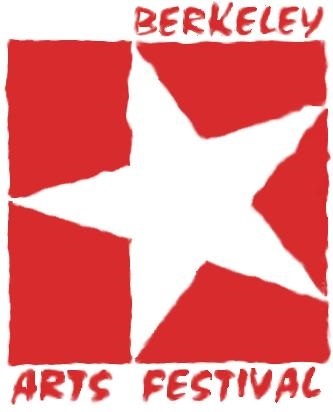 I’m looking forward to an exciting 2015-2016 season of multidisciplinary arts projects!